The Princess of Mars is set to return to her throne this January, as Dynamite Entertainment announces the relaunch of one of their most beloved characters, Dejah Thoris. Writer Amy Chu (Poison Ivy, Red Sonja, KISS) will bring the strong, iconic character back to the comics in the debut issue Dejah Thoris #0, which will retail for 25 cents and allow fans to join the adventure at this introductory price. This replicates the outstanding debut of Sheena #0, which broke 120,000 sales. Retailers can confidently stock their shelves with extra copies of this red-hot new series. This exciting prequel to Edgar Rice Burroughs' beloved book, A Princess of Mars, will delve into the untold story of the classic Red Martian princess! After learning of the legendary Gardens of Mars from her grandfather, Dejah Thoris, Princess of Helium, sets off on a dangerous scientific expedition to save her dying planet. But things don't go the way she planned when she encounters a mysterious Green Martian prisoner. 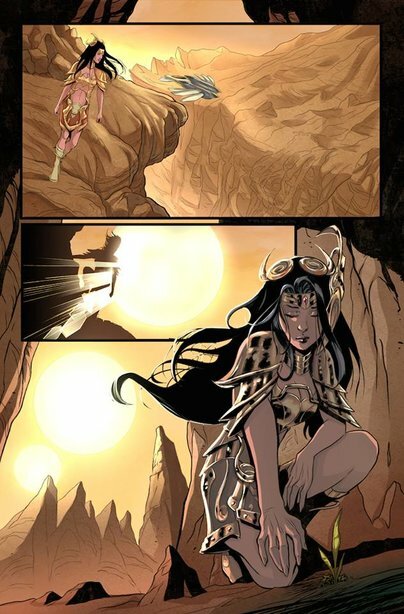 Writer Amy Chu says, "Dejah Thoris has always been a complex character, with the bearing of a princess, the mind of a scientist, and the heart of a Red Martian trying to save her dying planet. 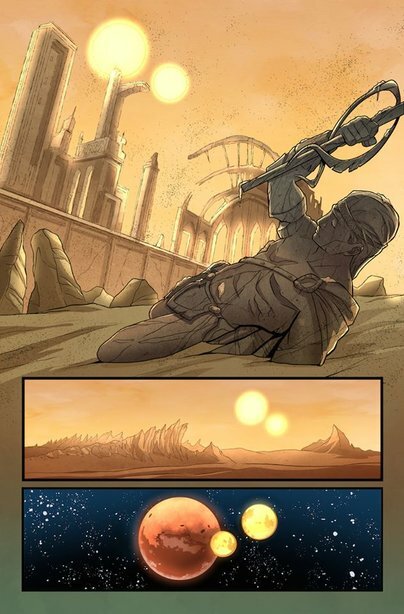 This new series is a Dejah Thoris story, not a John Carter story, and could be considered a prequel to The Princess of Mars - an adventure of the purest sort, like Indiana Jones, but on Mars." Amy Chu writes comics - and only - comics! Following a successful run heading the first-ever Poison Ivy mini-series for DC Comics, Chu began crafting multiple series for Dynamite Entertainment including Red Sonja and KISS. Chu also writes and produces comics for several non-profits including The New York Historical Society, The Baltimore Museum of Art, Pop Culture Classroom, and The Museum of Chinese in America. In her spare time, Chu can be found serving as a frequent speaker/panel moderator/guest at the top industry conventions including San Diego Comic Con, New York Comic Con, Heroes Con, and the Emerald City Comic Con and Fan Expo. "Amy has spearheaded two of our best-selling series with Red Sonja and KISS," states Dynamite CEO/Publisher Nick Barrucci. 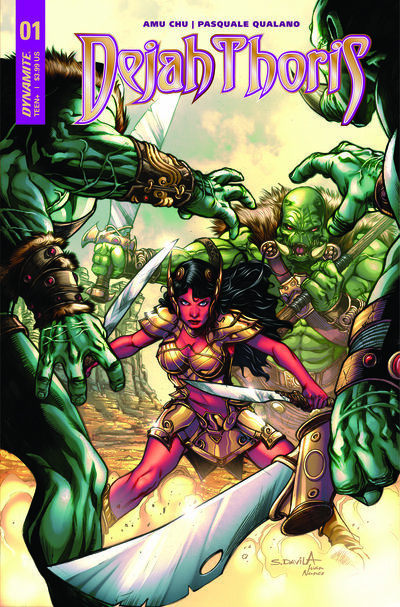 "Dejah Thoris has been one of our strongest characters who has headlined her own series. Bringing Amy's voice to Dejah was a natural choice. And to ensure the largest audience possible, we're launching this with an introductory price of 25 cents. As I've mentioned before, the introductory priced books allows retailers to stock up at minimal risk, and fans can sample a great series at the most affordable price possible. I cannot wait until fans see our new ongoing adventures of the Princess of Mars." "We're extremely happy to see Dejah Thoris gain a new audience among contemporary readers," says Jim Sullos, President of Edgar Rice Burroughs, Inc. "Mr. Burroughs created a timeless heroine that has enthralled and inspired generations of readers for more than a century." Edgar Rice Burroughs' classic characters, Dejah Thoris, the Princess of Mars, and her beloved hero, John Carter, debuted in 1912, and ever since, science fiction and fantasy enthusiasts have dreamed of the faraway Red Planet and all of its wondrous sights and monstrous perils. While Dejah initially appeared as the love interest of John Carter, the strong and talented royal always stood on her own, and never on the sidelines, often venturing into danger or battle -- and thus serving as a template for later strong, independent science fiction heroines such as Princess Leia of Star Wars and Neytiri of James Cameron's Avatar. Since her comic book debut in 2010, she has constantly served as an adventurous mainstay at Dynamite. Dejah Thoris #0 will be solicited in Diamond Comic Distributors' November 2017 Previews catalog, the premier source of merchandise for the comic book specialty market, and slated is for release in January 2018. Fans are encouraged to reserve copies of Dejah Thoris #0 with their local comic book retailers. Dejah Thoris #0 will also be available for individual customer purchase through digital platforms courtesy of Comixology, Kindle, iBooks, Google Play, Dynamite Digital, iVerse, Madefire, and Dark Horse Digital.